The NGO Vulture Viyangoda further states that they do not encourage partisan politics or allow race or ethnicity based divisions and adds that ethnic identities are completely outdated and irrational divisions for a modern, progressive and forward looking Sri Lanka. The main demand of this accidentally born Sinhala and Foreign and Tamil slavish Viyangoda was that Sri Lanka should be made a Secular State despite 75% of the population being Sinhala and out of this percentage 72% being Buddhists. The prominence being given to the main religion in other countries nullify his argument. For instance in the United States 70% of its population is Catholics and the President as a tradition takes oaths by placing his hands on the Bible and swearing his allegiance to the admonishes given in the Bible. This practice is followed in almost all the European countries. Islam is the state religion of Malaysia despite the Muslim population amounts to only 56% in that country. It is same in all other country where majority of the population is Muslims. In his latest diatribe against the former President Mr. Mahinda Rajapakse this NGO vulture Viyangoda in his latest article dated 22nd October 22nd to Vikalpa.org attempts to mislead the masses with concocted lies saying that Mr. Mahinda Rajapaksa accepted the ‘interim report’ of the new constitution and also accepted that there was a mandate for abolishing the Executive Presidential system. This NGO Vultur says at the 8th January, 2015 Presidential election the 6.2 Million voters exercised their franchise in favour of Maithripala Sirisena to abolish the presidential system and 5.8 Million voters exercised their franchise in favoir of Mr. Mahinda Rajapaksa under the condition of abolishing the Presidential system. Accordingly he says that as 12 Million voters acknowledge the need for abolishing the presidential system he asks what Sirisena needs further to abolish the Presidental system. Throughout this article this NGO Vulture plays with words to confuse the people about the statement issued by Mr. Mahinda on the Steering Committee Interim Report which he wanted the government to abandon completely. This shows that these NGO vultures are determined to confuse the masses, utter spiteful lies and get the constitution proposals adopted by whatever means. Sunanda Deshapriya whose photograph is shown is an accidentally born Sinhala foreign and Tamil slavish NGO vulture, self exiled to Switzerland allegedly due to JVP death threats for his involvement in PRRA death squad activities with Rajitha Senratne and now enjoying a foreign funded luxurious life in that country. In the pretext of being a Socialist he has carried out intensive treacherous activities against Sri Lanka. He presented reports and gave evidence against Sri Lanka in almost all UNHRC sessions held against Sri Lanka projecting Sri Lanka barbarous inhuman State represented by a ruthless army. Writing to Vikalpa website on the proposed new Constitution this treacherous NGO vulture said that the proposed constitution has now become a great expectation of the democratic political and progressive forces. He said that these forces expect that the new constitution would provide permanent solutions to the ethnic problem that remains unsolved for more than half a century and it would also provide a decisive impact for the future of this country. He says that it was with this trust that all minority parties – TPA, TNA, SLMC, ACMC, EPDP, and CWC voted for the last budget supporting the government. He points out that all Sinhala political leaders since gaining independence from the British have breached all promises given to the Tamil community. If the trust that had been reposed on Maithri-Ranil government by the TNA gets breached, the TNA would fall into a deep abyss and that void will be filled by the Vigneswaran politics. This NGO vulture states that it is happy to note that it seems President Sirisena is committed and determined to provide a reasonable political solution to the ethnic question and Ranil Wickremasinghe has indicated his commitment and determination to devolve powers. He points out that Rajapaksa forces have already indicated that they will not allow the government to get a two third majority in the Parliament for the constitution and warns if that happens chauvinism will reign and adds that it is the policy of both Mahinda and Gotabhaya to project any solution that would provide justifiable solutions to the Tamils as conspiracies against the Sinhalese. He commends the government steps to provide additional perks and privileges to Parliamentarians and says that these measures would help to keep the MPs loyal to the government. He also cautions that if this constitutional attempt fails the 2015 revolution would collapse and the country would plunge into chaos. The Janatha Vikurthi Peramuna (JVP) which even at its best showing got only 5% or thereabouts of the total votes whereas there were more votes spoiled than the amount it secured and the non-voters also outnumbered the JVP vote has become another gang of treacherous hooligans similar to the NGO ruffians to support the proposed constitution. The present JVP hooligans who have become bourgeois class representing the richest political party in Sri Lanka and alleged by Mr. Somawansa Amarasinghe that the leaders of this party received several millions of rupees to extend their support to reactionary elements has completely distanced from and gone against ideals of JVP’s founder Rohana Wijeweera, and betrayed the hundred thousands of Southern youth who sacrificed their prime youth to uphold the JVP visions. In order to fully solve the national question in Sri Lanka, to defeat the Tamil Eelam attempt, and to continue the maintenance of Sri Lanka as a multinational Unitary State, Rohana Wijeweera wrote his book Solutions to Tamil Eelam Struggle in 1985, and the JVP vehemently opposed any move by the government to grant a certain degree of self-rule to the Tamils in the North and East. Rohana Wijeweera in this book accuses Tamil separatists of being motivated by the “Chola ambitions” of the DMK, and aspiring to create a Tamil empire based in Tamil Nadu and the Northern region of Sri Lanka. He alleged that the reason why the LTTE had adopted the tiger symbol was to resuscitate the symbolism of the Cholan empire, which also used the tiger symbol. Even the name Eelam he traced back to the Eela Mandalam of the 10th and 11th centuries, when the northern region of Sri Lanka was governed as the ninth province of the Cholan Empire. Wijeweera exposed the Annadurai, Karunanidhi and Ramachandran plan to create a Dravida Nadu for the Dravidas, India for the Aryans and another India (Pakistan) for the Muslims. He said the Dravida Nadu was to be linked with Kerala, Andhra and Karnataka, Tamil Nadu and Eelam. Wijeweera stated that this was based on the demand of the bourgeoisie and the petty bourgeoisie. Regarding the history of India and Sri Lanka, he stated that the Dravidas of the kingdoms of the Chola, Pandya, Chera, Pallawa and Vijayanagar had invaded Sri Lanka from the fourth century onwards, and when their kingdoms had fallen, they had settled in the island. Wijeweera also drew a parallel between the fact the symbol of the armies of Raja Raja Cholan and his son Rajendra was the Tiger, and that is also the symbol of the separatist ‘Tamil terrorists’. Wijeweera predicted in 1985 that Polonnaruwa could not be made capital of these ‘separatist terrorists’, but Trincomalee will be made the capital of Eelam. He also said that the separatists would chase away the Sinhalese from Padaviya and Kantalae areas, as they were within the confines of the ‘Tamil Eelam’. Recent statements made and actions taken by the treacherous JVP hooligans completely contradict the views expressed by Wijeweera whose death they commemorate annually for political expediency and to mislead the village masses. Reports published on 23rd April, 2017 said that For the first time in the history of Sri Lanka a leader of the Tamil National Alliance had come to the Head Office of the Janatha Vimukthi Peramuna and has held discussions with the JVP leader Anura Kumara Dissanayake. Although this discussion was not open to media, Mr. Sambandan said that they discussed in length about the current political situation in the country. JVP Parliamentarian Vijitha Herath said that both parties agreed at this meeting on the necessity of a new constitution for the country. Report also said that they agreed a new constitution is essential and the JVP entered into a secret agreement with Sambandan. Addressing a media conference in Jaffna, the General Secretary of the JVP Tilvin Silve (popularly known as Tin Tin Silva) in the first week of October said that the new constitution is an excellent one and their party is committed and determined to support it fully. He said it is foolish to debate on mere words such as unitary and federal. Responding to a challenge made by MP Wimal Weerawansa calling the JVP leader AnuraKumara Dissanatake for a debate one the proposed constitution the JVP MP Vijita Herath debased Mr. Weerawansa and rejected the challenge saying that his party leader has nothing to debate with him and said that they fully support the proposed Constitution. Addressinhg a media conference in their party headquarters he said that their party leader has refrained from participating in public since a long time but addresses their party meetings and speaks in Parliament. The newspaper Ceylon Today reported on 23rd July 2017 that both 1978 and 1972 Constitutions were not passed through a referendum and the new Constitution is drafted, based on the 1978 Constitution. The Island editorial on 20th June 2017 said that JVP leader got the post of the Chief Opposition Whip for services rendered to the yahapalana camp by the JVP. A report published by Daily Mirror on 1st November 2016 claimed that the JVP leader Anura Kumara Dissanayake said that vicious forces are preventing the enacting of the new constitution which is more suitable for the country. Reports said that these double tongued JVP leadership recently urged Ranil Wickremasinghe to bring in soon the federal constitution of Ranil-Sumanthiran-Chandrika saying that the mandate for this purpose has been given by the people, and the JVP Parliamentarian Nalin de Jayatissa said that it is only an irrational fear that is being created in the hearts of people by Rajapaksa clan. The JVP polit-bureau member Bimal Ratnayake said that the statement of Mahnaayakes on the proposed Constitution does not need to be taken seriously and they completely disrespected the traditions that existed in this country and downgraded the sanctity of the Maha Sangha. The JVP leader Anura Kumara Dissanayake, said in a TV prohramme that it was with mutual understanding that Mr. Sambandan accepted the post of the leader of opposition and he accepted the post of the chief whip. Responding `to a question as to whether people’s representation is properly reflected in the opposition, avoiding the question he said that there is not much difference between his party and the TNA. Meanwhile, Mr. Wimal Weerawansa has said that the founder of the JVP Rohanaweera advocated that it is n unconditional responsibility to fight for the Unitary Status of the country and pointed out the imminent dangers that cause to the country by Federalism. He sid that if the JVP leaders have an iota of respect to Wijeweera’s policies it is they who should take the lead to counter the proposed constitution. He made these comments at a function hekd in front of the Fort Railway Station to distribute one million handbills against the proposed constitution. Another despicable NGO vulture singing fo the Tamil separatists is Jehan Perer of the NGO outfit called National Peace Council (NPC),funded by successive Norwegian governments, and the recipient of substantial funding from other foreign ‘sources.’ Throughout the war period this NGO vulture carrued out anti Sri Lana activities during UNHRC sessions n Geneva, This scoundrel accompanied the Sri Lankan delegation to the Geneva Human Rights Council sessions, in March 2017and backed Sri Lanka’s request for an additional two-year period to implement Resolution 30/1. He usually writes a weekly article to Island newspaper on uesdays and in this week’s article he says that the strident opposition to the government’s constitutional reform process highlights the regrettable fact that the country’s ethnic divide continues to be serious and thee opponents of the constitutional reform process have used the Steering Committee report to convince the Buddhist religious leadership that there is both a threat to the country’s national unity and to the foremost place of Buddhism within the polity. This Vulture says that based on this vituperative propaganda the leading Buddhist clergy have taken the position that the proposed Constitution is not suitable as it leads to division of power, including the assigning of powers to the Provincial Councils. 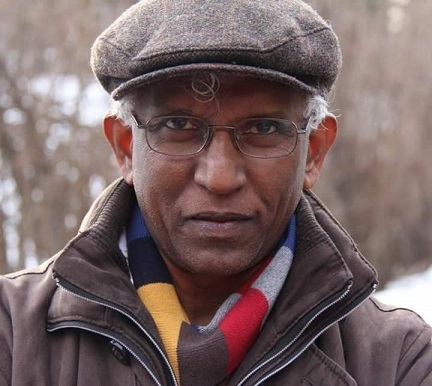 Jehan Perera is also an accidentally born Sinhalese and all his weekly writings focus on Northern Tamil viewpoints and urging the government to grant more and moe concessions to the Tamils andfacilitate self ruling for them. Please note that leading JO figures have gone to India about the same matter. Jehan Perera is also an accidentally born Sinhalese – Iayo Mother Lanka, is he born in Yaldevi or Urudradevi ??? Please note that leading JO figures have gone to India about the same matter- ie JO summons to India. soon Sampanthan/ MA sumithira/CM viggie will get summons from Modi ! Why JVP prevent identification ? They wanted to publish who are killed. As a young man I too was happy when UNPeers die when we were ruled unde Premadasa regime. 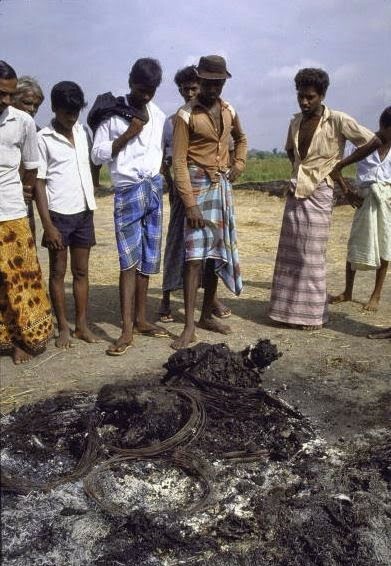 It was the Udugampola’s men and army who burnt suspected JVPeers with tyres to hid identity. Nizam has mistaken this completely.